your friends bday card is the biz. sometimes I find it difficult to be creative if my hesd is blocked with other stuff I am worried about or not sleeping. Fab tag, Penny! Love that crackle background and of course, her face. Perfect tag for the 'Soartful' challenge! Lovely work! A beautiful tag and it is fun to rediscover artwork that you have made! That image looks wonderful on the aged crackle background! What a great tag. 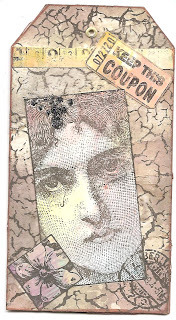 I love the Image of the weeping woman, and I also love the crackle background. he he- she is a very normal woman - red eyes 'n all ! Sometimes I have the start of numerous collage pieces stacking up that don't have the finishing design elements. I'm just waiting for them to reveal themselves. When I'm feeling less than creative I spend time just cutting out elements for future projects, bits of text, images and backgrounds for later use. Back when I was just beading I would sort beads for relaxation and sometimes then the combinations would appear for new designs.